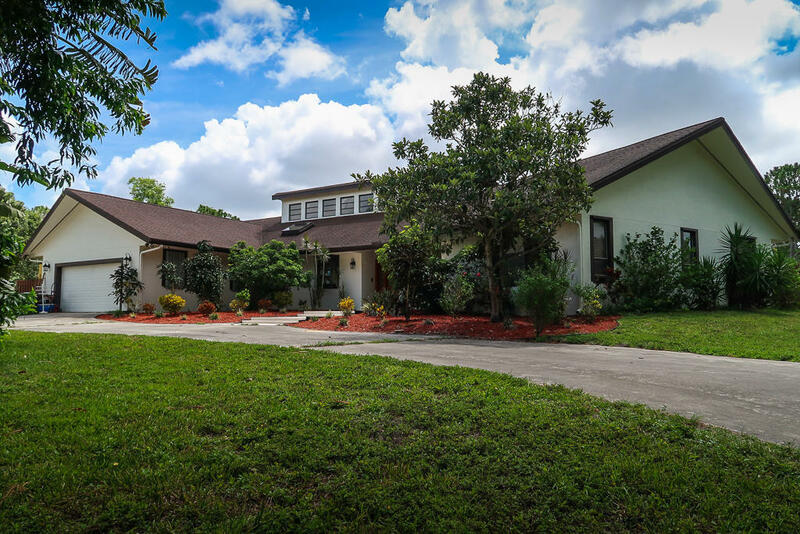 This 4 bedroom (plus media room which can be 5th bedroom), 3 bath, 2-car garage home with screened pool is located on a 1.15-acre lot on a paved road. Huge great room with 25' vaulted ceiling featuring clerestory windows and glass skylight, Alabama stone fireplace, sunken living room, and corner bar. Oversized salt-chlorinated and heated pool. Screened patio with stone fire pit and hot tub. Solid oak kitchen cabinets. Separate media/family room with stepped seating area and surround sound could also be used as 5th bedroom. Fourth bedroom/office features beautiful stained wood coffered ceiling and custom cabinetry. Jacuzzi marble tub, bidet, and wood tray ceiling accents in master bathroom. 18' wide circular driveway. Alarm system with integrated smoke detectors.